Forrays into the cinema of Rainer Werner Fassbinder are often fraught with traps and dangerous corners that leave you feeling lucky to have got out in one piece. My virgin voyage into his world was via QUERELLE, his final film made in 1982. This baptism of fire had me hanging out with oiled up sailors (a look that would be heavily borrowed by Jean Paul Gaultier) in an overtly homosexual murder intrigue. The next sample was taken from earlier in his career, 1974’s FEAR EATS THE SOUL, a reworking of Douglas Sirk’s ALL THAT HEAVEN ALLOWS. This film saw him disregard the technicolor beauty of the original setting and decend on a grimy urban flat where frowned upon cross racial relations were added to the taboo of significant age difference. I mean, just consider the two titles: ALL THAT HEAVEN ALLOWS ….. FEAR EATS THE SOUL. 4 words each with polar opposite effects on the psyche. Both of these flicks, for all their hard work, are strangely rewarding. 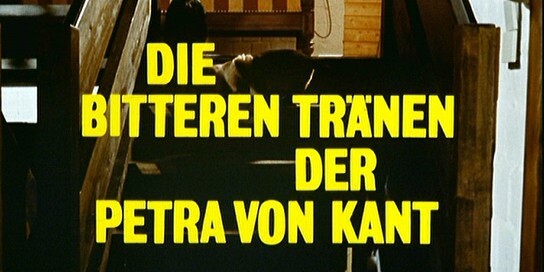 As is his 1972 film THE BITTER TEARS OF PETRA VON KANT. Petra Von Kant (Played by Margit Carstensen) is an apparently successful fashion designer, she has the outrageously stylish gowns, she takes the important calls, she has a long suffering PA / Maid / Co designer (Irm Hermann) who caters to her every whim without a word spoken, and I mean literally. The girl, Marlene is her name, says NOTHING the whole flick but is a constant presence. Hovering, typing, serving. All the while with a steely, unnerving calm that forces you to evaluate the importance she holds in Petra’s life. Marlene appears to show no emotion but you know she is wracked with them. She reminds me very much, from a purely expressive point of view, of the masked Alida Valli in George Franju’s eerie 1960 flick, EYES WITHOUT A FACE. The Bitter Tears is just over 2 hours long and is set entirely in Von Kant’s bedroom space. Over this time we are exposed to her every contradiction. She’s strong yet pathetic, successful yet a failure, kind yet caustic. The single location potentially creates boredom issues and there are points when the stilted dialogue demands a lot of the audience but we are rescued by a cluttered visual style which includes hugely differing wall decoration, mannequins, random clutter, bizarre costume and wig changes, (Petra’s hair changes in every scene) exquisite framing, camera movement and character placement, all of which keep the eye stimulated whilst this awkward scenario unfolds. During the visit of a cousin, Von Kant is introduced to her friend Karin (Hanna Schygulla) with whom she immediately falls in love. On the pretense of discussing a potential modeling job, she invites Karin back where a mini courtship ensues and Karin is invited to move in. Although Von Kant’s fragility is alluded to in previous scenes, it is the arrival of Karin that proves cataclysmic. There is a real special directorial flourish here that really floats my boat and should be looked for if you happen to view the film. Look out for a HUGE power swing over the span of a single cut. One would assume that, being adapted directly from a play, this point would be an act change, and it is cinematically of course. The juddering effect of such a theatrical approach on screen is extremely pleasing. The final act of the film is not easy to watch. There seems to be a desperation in Fassbinder’s characters. He himself was a troubled individual and this comes through in the work. Nevertheless, it is not impossible to feel sympathy for these people. The darkest recesses of the human emotional spectrum are sought out and pulled to the fore here. As an audience, we recognise, and perhaps forgive them because it is when we are at our most emotionally venerable that we are capable of actions far beyond what would be perceived as normal.